Heavy battery but powers my 55lb electric outboard motor all day just what you would need for a days fishing. no problem with the battery, i have used them for 2 weeks now, i think they are as good as others and are cheaper, will buy more from tayna. 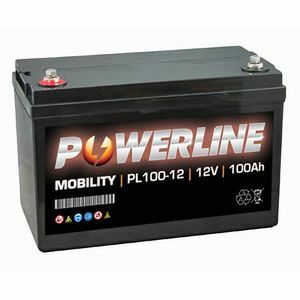 Needed two 100ah 12v batteries for my mobility trike. Most companies that I looked at wanted me to take out a mortgage but not Tanya. Batteries plus post and packaging came to the same price as one (yes ONE) battery from a leading supplier. The batteries were delivered as specified, on time (the delivery was scheduled between 11.25am and 12.25pm) bang on 11.25am. The courier even carried them to where I wanted them. The communication with the company was first rate and although it was done mainly online - the reply, the detail and the courtesy of the email was evident that this was company that was not just for the customer but for the product and their staff too. It was the most pleasant experience I have had EVER in buying online and that includes EBay, Amazon and all the rest. I have no qualms endorsing both the product and Tanya who never let me down and I am now back tramping the highways and byways once again. Many, many thanks to everyone from Tanya and their dedicated delivery team too.